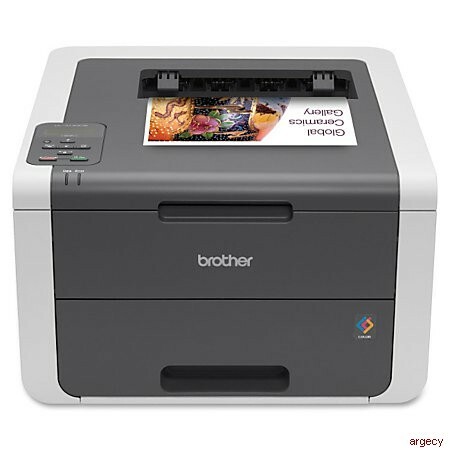 If you're looking for a fast, reliable Digital Color Printer with wireless networking for your small business, the Brother HL-3140CW may be exactly what you need. It takes big business features and packs them into an affordable, compact printer designed to fit your small business budget and workspace. This printer produces high-impact color and crisp black documents at up to 19ppm, so it's ideal for the business that primarily prints black business documents, but also needs to periodically produce professional-quality color documents in-house. It also offers wireless printing from your mobile device via: AirPrint, Brother iPrint&Scan, Google Cloud Print, Cortado Workplace and Wi-Fi Direct. Blazing Fast Printing. Fast color and black print speeds up to 19ppm to help improve your productivity. Flexible Connectivity. Easy to install on your wireless network or print locally via USB from your computer. Mobile Device Printing. Wireless printing from your mobile device via: AirPrint, Brother iPrint&Scan, Google Cloud Print, Cortado Workplace and Wi-Fi Direct. Help Lower Your Operating Costs. High capacity color toners available (approx. 2,200 pages each) to help lower your cost per copy. Unit Dimensions (W"xD"xH") <16.1" x 18.3" x 9.4"
Carton Dimensions (W"xD"xH") 23.5" x 20.5" x 14.3"
Unit Weight (lbs) 37.5 lbs. Carton Weight (lbs) 44.9 lbs. Mobile Device Compatibility Requires connection to a wireless network. AirPrint is a trademark of Apple Inc. Cortado is a trademark of Cortado AG. Multi-purpose Tray Capacity Maximum capacity based on using 20 lb paper.